It has been a known issue that some of the BlackBerry users will forget (once in a while) their BlackBerry ID passwords. When the passwords are being reset, confirmation links will be sent for the password resets, however, are being unsuccessful. 2. Go to “Third Party Applications”. 4. Set up your account with a different e-mail address. An interesting feature in your BlackBerry allows you to block some messages, including SMS, emails and PIN messages, from getting through to your smartphone. This firewall setup on your handset may well be the answer to getting away with those unsolicited messages you have been incessantly getting on your phone. 1. Select the OPTIONS icon from the Home Screen. 4. Put a tick mark on the Enable checkbox. 5. Select the Message Types you would like to enable the Firewall on. 6. Press the BlackBerry icon from your keypad and select Save. Ever wondered if you get the famous BB PIN on your BlackBerry PlayBook tablet? The answer is “yes,” and here’s how you find it. Apart from helping you synchronize your files, backup your data and restore your platform, the Desktop Software also allows you to see your BB PIN for the PlayBook. Simply connect the tablet after installing the Desktop Manager on either PC or Mac and the main screen should automatically show the PIN with the rest of the information. After taking your new PlayBook out of the box, or perhaps after resetting the whole device by performing a security wipe, the device will require the process for the Setup Wizard. 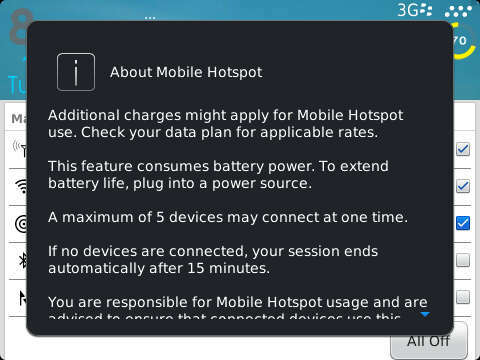 To get the BB PIN from the setup wizard, while at the Wifi Network settings screen, select the settings icon or gear icon located at the bottom left corner of the screen. It will then direct you to the Diagnostics screen where ” technical” details about your tablet will appear, including the BB PIN. Once you have already gone through the Setup Wizard, you can still view the tablet PIN through the Settings option. Simply tap on the Settings icon from the Home screen, tap About option, and then from the drop down box saying “View Information About Your Tablet” select Hardware. Voila! You get your BB PIN displayed. So next time you’re asked whether you got a BB PIN on the tablet or not, don’t break a sweat. You got the answers above. Managing your photos, videos, music and other files has never been easier with the BlackBerry Media Sync 3.0. Now, BlackBerry smartphone and PlayBook users can sync their files from both the PC or Mac with this convenient feature of the BlackBerry Desktop Manager Version 6 (Note: users must have the Desktop Manager v6 first to access the features of Media Sync). •Sync your selected playlist from your desktop computer to your smartphone or tablet. Create specific playlists when you relax at the cafe, or workout at the gym and send it over to your device. •Edit your playlist that will automatically sync to your computer. •Import photos and videos to the computer and vice-versa. •Select which photos you’d like synced to your computer. The BlackBerry ID is your sole access code to the main BlackBerry website, the BlackBerry App World when downloading apps and other BlackBerry stuff and exclusive products. This is the only passcode you have to remember and get full access to enjoying all these BlackBerry services. 3. Fill out the empty fields on the page. The username is the same as the email address associated to the account. The password must be unique from the rest of the information you have created. 6. Go to the email account associated with the BlackBerry ID you have created (which is the same as the email address) and validate the BlackBerry ID by clicking the link in the email message. Validating the ID through your email must be done within 24 hours to keep the validation from getting expired. BlackBerry OS 6 and OS 7 handsets come with a pre-installed RSS/ Social Feeds application that gathers all your major social media contents (including Facebook and Twitter), podcasts, blogs, etc., and pushes it into this one-stop application. One of the great benefits of utilizing this RSS / Social Feeds app on your smartphone is that it helps you save a lot of time (and some trouble) in checking these social networking sites and other online sources individually. The RSS/Social Feeds for BlackBerry allows you to pull up this single application to access several social media accounts and online content. 1. Select the icon for RSS/Social Feed on your icon tray. Yes, it is the orange icon that you probably don’t normally put much attention to. 2. Choose the Getting Started option on the application once it has launched. 3. Select the applications/sites that you’d like to integrate with your RSS/Social Feeds app and log in to them (say, you choose Twitter and Facebook, which I would automatically assume you would) with the corresponding username and password. *For RSS Feeds (for blogs and your own favorite websites), simply scroll on the navigation bar above the screen until you get to the RSS screen. You may now manually add the address of your favorite blog page or simply select the site already on the list. 4. After logging in to the respective social media accounts that you have, and chosen your favorite podcasts and blogs for the RSS, select the Back Key/Return on your keypad. 5. Voila! The RSS/Social app should now show the “feeds” on your timeline. Apart from being able to view content, you can also use it to post statuses to your social media accounts. *To scroll from one RSS/Social Feed to another, simply slide your forefinger (or thumb, whichever one it is) across your trackpad or touchscreen device. *To filter the feeds from your Social Media content (i.e. your Facebook or Twitter or your BBM), you simply click the navigation bar showing Social and then select the specific social media account you’d like to have a view of. What do you think of the RSS/Social Feeds for BlackBerry? Perhaps one of the highlights of the BlackBerry Messenger application is the ability to send out broadcast messages for selected contacts to read. This powerful tool allows us to share news, important updates or invites to family and friends at one time. But as the line from a movie goes: With great power comes great responsibility. More often than not, we find ourselves getting inconvenienced by unsolicited messages that some users have the audacity to put out. With BlackBerry Messenger now becoming as universal as Facebook or Twitter, social media etiquette plays a very important role in how we use this important communication tool. Obviously, a thinking, rational person would know that forwarding a message like that doesn’t make the smiley icons updated. To stretch the issue a little bit, if RIM does send out updates, they will do so on either the App World or their website. The situations range from updating smiley icons, to unfounded news, to unsolicited updates of your life (something in the line of: “Hello guys, I’ve had my lunch. How about you?”) Before we send out these messages, perhaps it would really be good to STOP a little bit, and ASK: Is this something that the recipient would really NEED to know? Now, if you are one of those guys who really would like to use BBM as your Twitter to tell everyone that you’ve had your lunch or your dinner–whatever the case may be– you can use the STATUS option on your profile to let everybody know what you’ve done or are currently doing. You can even go as far as putting in your STATUS how you feel about something or someone. This way, you are not intruding on anyone with your unsolicited messages or updates. Remember, when the red LED light blinks on a BlackBerry, we are already taking a minute or two of somebody else’s precious time to read these messages or emails. We had better make the message worth those two minutes of his or her life. 2. Will this affect my outward image and credibility? Sending out a broadcast message can also be a powerful marketing tool for your business or endeavour. This is how we can build a network of would-be business partners or potential clients. Every time somebody reads our messages, we are consciously or unconsciously being scrutinized by the recipient. The person on the other end gets an impression of our intelligence, perhaps of our upbringing and even our education. The words, the language, the expressions that we use create an image of who we are. Imagine, if a person puts out a message about events or a certain business venture, this person comes across as someone who is career-driven or goal-oriented. He comes across as someone professional, perhaps reliable and smart. Now, if a BBM contact sends out his grudges and complaints about somebody or something for everyone to read, what values does it say about this person? Do you trust someone who says bad things about another person to everyone in his/her contact list? Does bad-mouthing anyone publicly create credibility? Remember, social media allows us to freely communicate with virtually anyone in the world. Whether that be your next-door neighbor, your boss, your enemy, your best friend, your colleague or your competition, a Hollywood star or the president– the power to express is everyone’s birthright. As human beings, however, we are equipped with more than just the ability to communicate; we are also equipped with a brain placed on top of our head to make us beings that STOP and THINK before we act. Let that same brain work for us every time we click the send button on our broadcast messages. 3. What will I gain in sending this message? I guess this is a basic question everyone needs to ask himself or herself before sending put these broadcast messages. To corporate users, obviously broadcast messages allow them to efficiently work with colleagues and clients, especially when calling out for emergency meetings or round-table discussions. We have to remember, however, that a lot of BlackBerry users now are the general consumers who want to regularly get connected with friends, family, and even casual acquaintances. Now, we send out messages to people because there is something that we would like them to know; there is something that we would like to get across. Whether we want to let them know that there is a birthday party we’d like them to be present in, or that there is an important news that has just come up, these messages that we send out mean something. But more than being able to tell them what we want, perhaps the more important aspect of communication is the benefit we will gain in sending out a broadcast message. Is the message going to help you invite a dozen friends to a party or an event? Is it going to gain me friends? Is it going to help me make a good impression to my contacts? Remember, an action yields a result. How we use the BBM broadcast message capability will always depend on what type of result (or consequence) we want to get. If we use it with a lot of responsibility, chances are we get positive results. If we use it otherwise, we only defeat the purpose of BlackBerry Messenger, which is to connect and communicate with the ones who matter. The age of information marks a momentous time in human interaction with technology. From the world wide web to your own smartphone, data is now more readily available to almost everybody. And to a lot of tech companies who are competing for profit and popularity, access to certain information is the name of the game. Day in, day out, we hear lawsuits being filed against a company’s breach of security; we read news about complaints against smartphone manufacturers who gather data without authorization. These news are endless, and as we head toward another decade of technological advancement, security of information becomes just as necessary as having a roof over your head, and food on your table. In the midst of all these, RIM has remained a company that takes security at the topmost of its agenda. With government agencies and big companies choosing the BlackBerry brand for their communication needs, RIM has established an infallible reputation of being one of the most secure devices that anyone can use. If you’re an owner of a BlackBerry smartphone, I would take the liberty of assuming that there is one icon in the tray that’s rarely given any attention (if not deliberately left unused). Whether you feel like it’s something you don’t have a need for, or something you get confused with, the BlackBerry Password Keeper is an application you normally just pass your cursor by. (1) The Password Keeper is located in the Applications Folder (unless you’ve hidden the icon at some point on account of your confusion). Once you launch the application, it will prompt you to create a new password (and I am much obliged to say that this must be something memorable and secure). (2) After you have a new password successfully entered, we now head over to storing the passwords for the respective sites (like your banking online, or your Facebook) you’d like to keep a record of. To add the password (say, for your online banking), choose the option “New Password”. This will launch some fields/boxes where you can type in a Title (say, HSBC Bank Account Password), the username, the password, and the URL of the site. (3) After all these information have been put in, press the ubiquitous Menu key (the BlackBerry logo on the keypad) and select Save. That simple? Yes. And now, you no longer have to pass by that un-assuming icon with a feeling of anxiety or confusion. Seriously, these days when almost everything is done over the internet, Password Keeper is a wise choice for a wise man. Our precious BlackBerry® smartphones have an exclusive application in helping us track or find locations almost everywhere. If you’re out and about the metro looking for a good cafe to spend those lazy afternoons at, or perhaps you’re cruising around a new neighborhood getting familiar with the place, BlackBerry Map® is sure to help you find your way. 1. Search for Location: This option comes handy when new to a certain area or place and you need some assistance in finding your way through. This can also be very helpful when looking for a nice spot you’d like to have your lunch or dinner at. How to do: Bring up BlackBerry Map® from the icon icon tray by choosing “Maps“. Click or select the Menu key (BlackBerry icon) and choose the option “Find a Location“. Here, you may type some info regarding the place you’re searching for. After putting the available details about the location, press the Menu key again and select “View on Map“. 2. Share a Location: So you drag your friends on a weekend road trip and you find yourselves messed with the directions? This option helps you send each other details about the places you are in. How to do: This one is piece of cake– you simply choose whether you’d like to send the location you currently have on the screen, or share one of the places you’ve tagged as a favorite; you press the Menu key and choose “Send Location“. You may opt to send the location either through email (which must be configured in your handset) or through BBMessenger®. 3. Tag Location as Favorite: Have you frequented a particular cafe or shop in your area? Or perhaps loved driving to a particular spot in the metro on weekends? Well you can already flag this location as a favorite on your BlackBerry Map® application. How to do: Launch the BlackBerry Map® application. Search the location you would like to tag as your favorite (check #1 item on how to search a location). Hit the Menu key, and select option for “Add as Favorite“.